The Most Active Meteor Shower of the Year Peaks Tonight. Here's How to See It. There is no meteor shower in 2018 that will light up the sky more brilliantly than December's Geminid meteor shower. 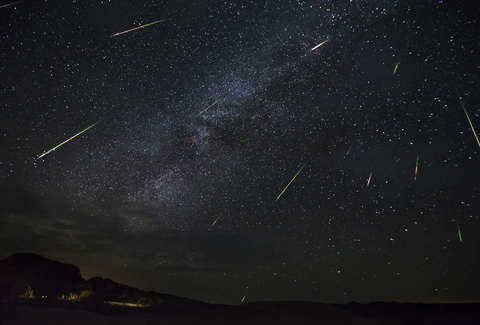 Yes, there are showers that are arguably better because they have plenty of meteors and land in a warm month -- like the Perseids -- but there isn't a shower that can rival the number of meteors the Geminids will cast across the sky. For that reason, it's an absolute must-see for stargazers. The Geminids will peak the night of Thursday, December 13 through the morning of Friday, December 14 with between 120 and 160 meteors per hour, according to Bill Cooke of NASA's Meteoroid Environment Office. Despite the frigid temperatures you'll have to endure, the Geminids can put on a breathtaking show with its bright meteors flashing above up to twice per minute. While the Geminids reach peak this week, the meteor shower is active in early December each year, when Earth passes through a trail of debris shed by a rocky space object named 3200 Phaethon, according to NASA. The dusty debris from the object burns up as it plummets through Earth's atmosphere, resulting in the spectacular meteor shower. The origin of 3200 Phaethon, however, isn't 100% clear. "Phaethon’s nature is debated. It’s either a near-Earth asteroid or an extinct comet, sometimes called a rock comet," the space agency said in a blog post. "There is another object -- an Apollo asteroid named 2005 UD -- that is in a dynamically similar orbit to Phaethon, prompting speculation that the two were once part of a larger body that split apart or collided with another asteroid." When will the Geminid meteor shower peak tonight? Although you'll be able to see meteors as early as 9pm on Thursday night, the display won't be at its peak at that point and the moon will block out many meteors until later in the night. The best time to see the show will be around 2am local time on Friday, according to Cooke. "The moon will be first quarter," Cooke told Space.com. "So it will set around midnight; there will be no moonlight to interfere with the Geminids this year." That's good news because the moon is capable of making a meteor shower all but disappear, as it did with this year's Leonids in November. Where will the Geminid meteor shower be visible? For the best view, you'll need to head toward dark skies, far from the light pollution of urban centers and suburban sprawl. If you can't see major constellations where you're standing, chances are you'll have a hard time seeing many meteors. The darkness is necessary to see the meteors, though it can take 20 to 30 minutes for your eyes to fully adjust to the dark once you get to your destination. That said, it would behoove you to arrive a little early and get situated. "The actual number [of visible meteors] for folks out in the dark countryside will be slightly more than 1 per minute," according to the NASA blog post. "Folks in suburbs will see fewer, 30 to 40 per hour depending on the lighting conditions. And those downtown in major cities will see practically nothing -- even though the Geminids are rich in beautiful green fireballs, the lights of New York, San Francisco, or Atlanta will blot even them out. Dark clear skies are the most important ingredient in observing meteor showers." Of course, in addition to dark skies, you'll need those skies to be clear. If it's a cloudy night, you're out of luck. Be sure to avoid areas where tall trees block your view of the sky, too. You want to be able to see as much of the sky as possible. 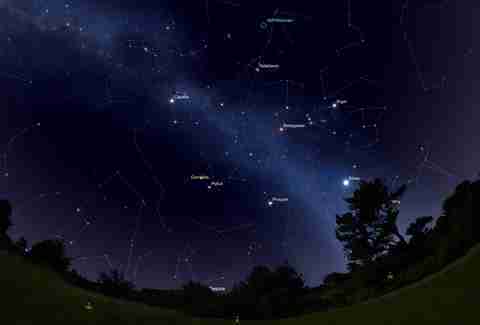 According to a map detailing conditions for the Geminid meteor shower from AccuWeather, the latest forecast calls for cloudy conditions across much of the country, which will result in poor visibility for many would-be stargazers. Major cities on both coasts and in the Midwest are sadly among the areas where you likely won't be able to see many meteors, while areas in New England, the Southwest, and parts of the West will enjoy fair to good viewing conditions. In any case, check you local weather and step outside to look up for a few moments before heading out into the cold. The Geminids will appear to radiate from the constellation Gemini in the southwest sky if you're watching in the northern hemisphere. As with the radiant point of any meteor shower, it's best to look slightly away from the constellation. Because the meteors will appear to emanate from the constellation, they'll be moving away from it across other parts of the sky. Again, the more sky you can see, the more meteors you're likely to spot. It's best to lie on the ground or lean back in a chair, so you're taking in at as much sky as possible. The back of pickup truck or the hood of your car are pretty good substitutes if you don't have a comfortable spot on the ground. It's winter after all. Going out in the middle of the night to watch a meteor shower isn't the easiest task, especially if you have to get up early for work on Friday morning. So, if you're thinking of sitting this one out, you can still see some of the action online via various live streams. Slooh is streaming the meteor shower live from 6pm to 10pm ET. NASA also tends to offer live streams of meteor showers, so be sure to check out its various social media channels in the hours before peak as well. If you can't catch the Geminids or the weather sadly isn't conducive to viewing the show, there's just one more major meteor shower to see before the year's up. The Ursid meteor shower will peak night of Friday, December 21 into the morning of Saturday, December 22. While a Friday night meteor shower would be ideal at any other time of the year, this one falls just days before Christmas, so there's a good chance that shopping, gift wrapping, or traveling may keep you from getting out to take in the spectacle. Then again, going outside and looking up may be the moment of serenity you need to stay sane this time of year. But between the two showers, the Geminids is the one to see. Get out there, pack a thermos of coffee, and try to stay warm while a spectacular show lights up the winter sky.